I am Mattis Eynard from France. I am still in high school. I like making project (most of them based on arduino), the french-boxing and I am also first-responder. With three friends we are developping a resuscitation device, which can insufflate and do a heart massage. It as to be ready-to-use, user-friendly and portable. 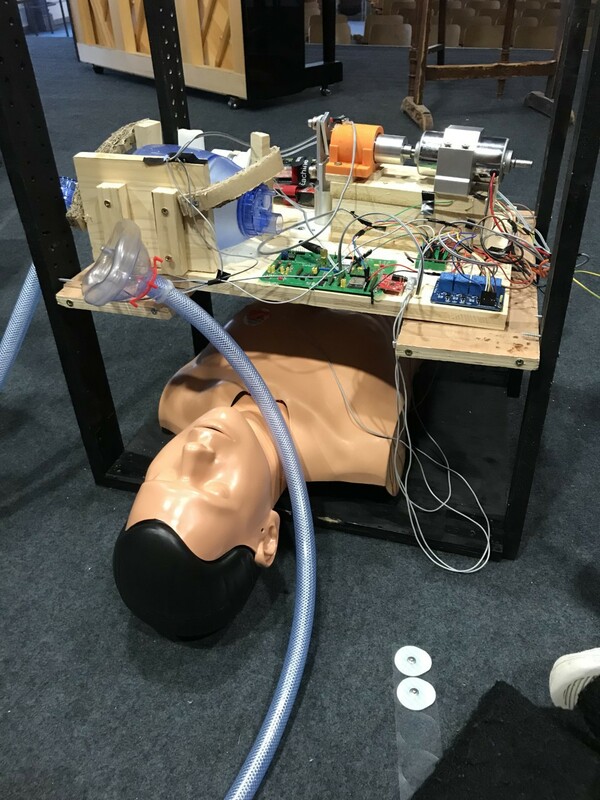 Our first prototype was able to do the CPR (CardioPulmonary resuscitation), send SMS and draw ECG. We are developping the next version of the device: this one will detect if someone as an heart attack or not, thanks an AD8232 and a algorithm, it will communicate all the data to the rescues. We have developped our PCB. We are using an ESP32, programmed with the Arduino IDE. Hello! This may be a bit off topic for this forum , however, I do not know where else to ask. I have two ESP32's communicating via UDP where one of the ESP's is hosting a SoftAP, with the WiFi library. The other ESP connects to the SoftAP, and they start exchaning packets via UDP. Now I want to see this exchange in Wireshark, to confirm they actually do exchange packets properly. I have Wireshark running in monitor mode, and I can see the DHCP exchange. However, I can then see EXACTLY six UDP packets, and then it completely cuts out, but still see beacon frames and everything else. Meanwhile, in the Serial monitor, the exchange is still going on, sending messages..
Do anyone know why this is happening? THANK YOU SO SO SO MUCH everyone who's contributed to this forum and supported me! to find a combined acceleration of the 3-axises - x, y and z - store that in a variable, subtract from that variable a new reading of the combined acceleration. It was also good to find out that what I was experimenting at the beginning (original code I posted in #0) still has a use! I haven't tested out the equation yet, but how the equation fits in this whole code/project makes so much sense now. I might report back once I test and am confident enough to explain what exactly I'm doing my code. It depends on which QMC5883L you're using. After a somewhat torturous investigation, it turns out there's an A and B version of device, labelled DA5883 and DB5883 on the chip respectively. The DA5883 is identical to the HMC5883L, except (and I kid you not) that the status register doesn't work. In this case it's possible to use a HMC5883L library, but it's necessary to comment out lines that poll the data ready (RDY) bit in the status register. Instead just read the data after a sample time delay of so many milliseconds in your sketch. The DB5883 on the other hand is a completely different device and functions according the the QMC5883L datasheet. In this case, as jremington suggests just use a QMC5883L library instead. It's rather frustrating, as these changes are completely undocumented and have caused a good deal of confusion for those of us using this device. Hi, I have done a project with Atmega328. I have disabled the reset pin to use reset as IO, I need to change the firmware inside the chip now. What is the way to unbrick it? How can i unbrick my chip without removing it from the board? Because its soldered in the pcb. Sono sicuro che non era questo che intendevi dire, ma sta di fatto che c'è chi acquista su aliex e magari gli va liscia, ma c'è a chi non va per niente liscia e 1, 100, 1000 pezzi non fa differenza (o quasi). Non è detto che questo sia il caso della ditta WavGat. Can anyone help me with the code to read Serial1 on the serial monitor? I am using an Adafruit Ultimate GPS to read the data on Serial1. The GPS module can be used for direct computer wiring but it's using serial port digital 0 and 1 for RX and TX, but how can I use the code for direct computer wiring to read on the serial monitor?